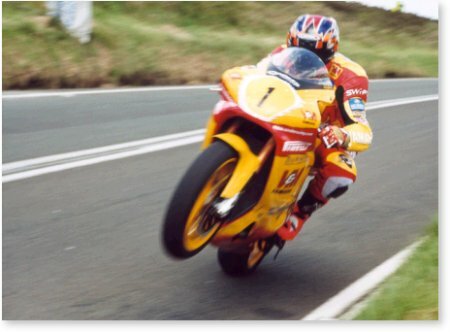 The TT Website.com Gallery will be bringing to you, all the action shots of TT 2002, by one of the Isle of Man's leading Photographers, Trevor Burgess. All Photographs displayed in the TTwebsite Gallery are digitally protected. Anyone discovered using these without our express permission will be subject to judicial prosecution. Computers 4U at Copycat, Ramsey. Office Supplies 4U at Copycat, Ramsey. In addition Trevors' full TT2000 portfolio will be on display at Summerland on the dates below with orders being taken again for prints to be posted out after TT. Both shots of Joey Dunlop (displayed) are being made available as strictly limited edition prints on stretched Canvas (The effect will be like a very detailed painting). Only 200 of each will be printed in this way, each signed and authenticated by Trevor. Samples of both will be displayed at Summerland on the dates below. Also all of the TT2002 shots are being made available ASAP to Computers 4U at Ramsey where digital prints can be obtained there and then instead of waiting until after TT. Orders are also being taken for a CD photo album Trevors' shots of TT2002. This will include a minimum of 500 digital shots of the TT Festival each shot being viewable and printable up to 6x4" size. This will be produced and posted out after TT. The aim is to include all the action, atmosphere and spectacle of the TT Festival in a digital photo album. All of Trevors' shots (TT2000 and TT2002) can also be reproduced onto T Shirts, Polo Shirts, Mugs, Mouse Mats, Postcards, etc with any text, logo etc requested courtesy of Computer 4 U in Ramsey. All items printed to order to the customer's design requests. Orders can be taken direct, or again orders will be taken at the Summerland displays. A sample of Trevors work taken from the 2000 TT is now on line and can be viewed by clicking on the link above. A fine example of the work that Trevor produces, is posted below for you to view, and you must agree this is a great action shot of Dave Jeffries at Keppel Gate.